Animal Planet brings viewers into a world dominated by ferocious rivalries, fierce bonds and extraordinary risk as it documents the behind-the-scenes lives of jockeys and their magnificent racehorses. It is a world ruled by 112lb men on 1,200lb thoroughbreds, equipped with oversized personalities and big dreams. 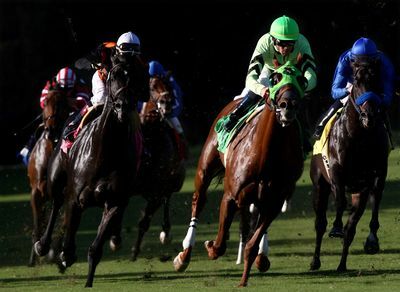 Jockeys follows numerous athletes as they compete alongside each other during the course of a 30-day racing season. This is the only pro sport where if you don't win, the pay is next-to-nothing. With the pressure so high, months of preparation go into each one-to-two-minute race, and jockeys ride as many as 10 races a day risking life and limb, so much so, an ambulance tails each race. Big winners, who have won horse racing's richest payouts, live beside the jockeys who have never won a race and struggle to make next month's rent. It is cut-throat competition, and Animal Planet will follow the action from pre-race jitters to the finish line, and everything in between.